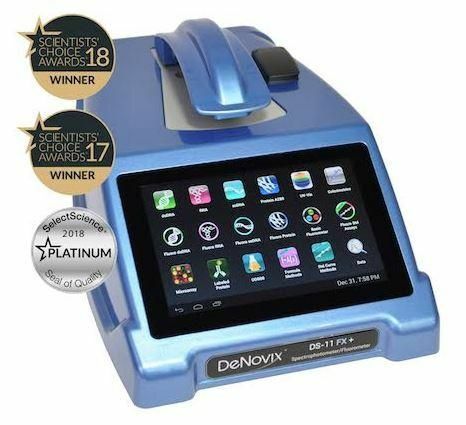 DeNovix Inc. (Wilmington, Delaware, USA) develops, manufactures and sells laboratory equipment and assays for life science applications. Our stand-alone instruments for quantification of nucleic acids and proteins include UV-Vis Spectrophotometers, Fluorometers and integrated systems combining 1µL UV-Vis, cuvette UV-Vis and Fluorescence. The compact devices include pre-installed EasyApps®, an Android based HD touch screen interface and built-in Wi-Fi, Ethernet and USB connectivity for export to networks and printers. Our instruments and assays allow researchers to quantify the broadest range of biomolecules of any microvolume instrument including dsDNA quantification from 0.5 pg/µL to 37500 ng/µL.